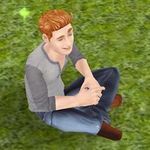 Are your Sims involved in an intriguing tale? Do you like to post about who did what with who? This is the place for YOUR stories! Quest house is in the lower left corner! Julie and Toby get married.